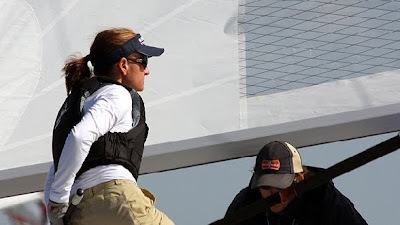 It was a joy to return to the helm of the Melges 24 last week during a training session in Annapolis, MD. I’ve come back to the Melges after spending the summer match racing in slow tactical boats. The Melges 24 is anything but slow. They reward feel and strength and seem to handle better the faster they go through the water. Believe me, we put the boat through the ringer this past week and it felt great! We benefitted greatly from sparing with our training partner Alan Field and his crew aboard “WTF.” Alan is an excellent driver with a history in the 470, Martin 242, and Farr 40 classes. Sailing with Alan is Steve Hunt, Erik Shampain, Jeff Reynolds, and Sarah Curran. The WTF team is a top performing boat in this US Class and Team Brick House was grateful for the chance to line up next to them. Leading the group was our coach Dave Ullman. A sailing legend, Dave is the 2007 Melges 24 World Champion. Dave put our training group through a rigorous test of boat handling and side-by-side speed testing. WTF and both Brick House Boats were using our Ullman sails and we were able to share tuning information because of the similar set ups.